The assault on the red dot and ACOG continue with 1-8x scopes becoming more and more mainstream. Now that we have 1-8 optics at every price point which are the best ones? We have found the Vortex Strike Eagle 1-8×24 to be the best overall 1-8x scope you can buy right now. Read below to find out why and where the other excellent options stack up. It wasn’t too many years ago when 1-4x scopes were the new hot ticket. Shooters everywhere were wanting one to maybe replace that red dot or ACOG. Years later we have 1-8 scopes. The first 1-8x optics actually came out quite a bit ago. 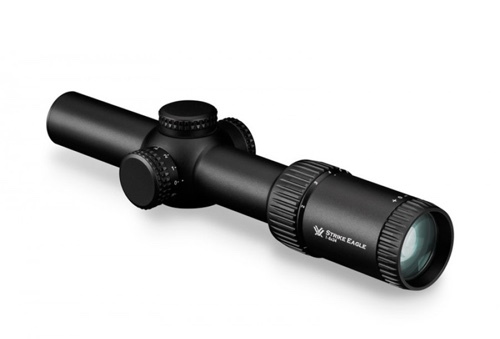 Back in 2011 Premier optics released their prototype 1-8 scope. Years later US Optics released their 1-8 to rave reviews. Today we have several new options that fall into price brackets us normal folks can actually afford. Quick note for bolt gun users: There’s been a huge jump in interest in mounting these 1-8 scopes on bolt guns. Safari hunters for years have been putting 1-4 and 1-6 scopes on their rifles but now that 1-8 scopes are out North American hunters and shooters are seeing the benefits having a 1-8 scope on their bolt gun. Most 1-8 scopes have generous mounting options so low profile 30 or 34mm rings would make an excellent mounting option for your bolt gun. True 1x: Early 1-8 scopes were plagued with the issue of not having a true 1x on the low end. This is important because it is what allows the user to use the scope with both eyes open just like they would with a red dot. Any magnification can make this task near impossible. Some optics makers were truthful about their scope not being a true 1x like Leupold was with with their mk8 1.1-8. Others however were not. Every scope in this list has a true 1x or is darn close. Usable Reticle: Having a usable reticle is necessary on any scope but especially with 1-8x optics. Scope makers have the difficult task of creating a reticle that is usable at 1x but also gives the shooter some precision when cranked up to 8x. This has proven quite difficult for some makers but has resulted in some pretty clever FFP and SFP offerings. Dialing Turrets: Most shooters seem to be 50/50 on wanting to be able to dial their windage or elevation on 1-8 scopes. With 8x on the high end these scopes can legitimately be used for long range precision work. For those that wish to do that going with a model that has exposed turrets wouldn’t be a bad idea. Most are probably scratching their heads wondering how a sub $500 scope wins best overall. Fact of the matter is this scope is not as good as the Trijicon or the Primary Arms Platinum in raw performance. The reason the Vortex Strike Eagle 1-8×24 won best overall 1-8 scope is because it is about 80% as good as those other more expensive scopes all while costing 1/3rd the price. The Strike Eagle 1-8 was just released this year off the success of it’s little brother the Strike Eagle 1-6×24. Glass quality is right on par with scopes in the sub $800 market and will most likely leave you quite satisfied when shooting during the day. 8x does have a slight drop off in brightness, this is especially noticeable when hunting or shooting in the early morning or evening hours. This is somewhat because of the price point that this scope is at but is mostly a byproduct of have a 24mm objective lens. 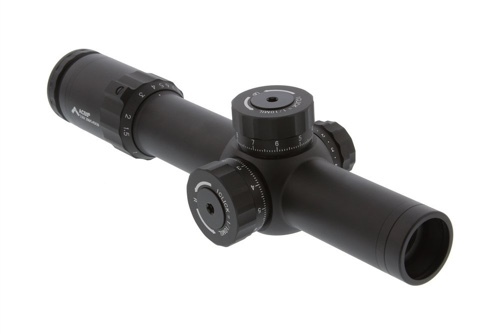 This scope has covered turrets that are primarily used for zeroing the scope. This makes the scope super compact and a great choice for the 3 gun shooter or hunter that wants the most compact 1-8 they can get. Illumination is daylight bright and works well with the SFP BDC style reticle. Eye-box is very generous at 1x but tightens just a bit when getting close to 8x. This is very common in scopes that have magnifying ratios of 8x. Bottom line, for the 3gun shooter or hunter looking to get the most scope for their dollar the Vortex Strike Eagle 1-8×24 is probably the best overall 1-8 scope they can get. At sub $400, the Primary Arms 1-8×24 is cheapest 1-8 scope that is worth buying. Primary Arms has been making budget optics for years and has really figured out how to make some reliable scopes that nearly everyone can afford. So what do you give up on this scope when comparing to the Vortex Strike Eagle? Lets start with glass quality. Most shooters agree that when in the upper range (i.e. 7x-8x) the image quality could be better. The scope is certainly usable at full magnification but it does give up a bit of image quality to the Strike Eagle. Illumination is daylight bright and surprisingly good for a scope at this price point. When compared to the Strike Eagle this is a tie. The turrets on this scope are covered and designed to stay that way. Just like the Strike Eagle 1-8 you should probably just use these turrets for zeroing the reticle then leave the caps on. Durability seems to be right up there with the Strike Eagle, magnification ring has similar feel between the two scopes. If the high $300’s is your absolute max for an optic I think you will be very satisfied with the Primary Arms 1-8×24 as it is one of the bets budget 1-8 scopes. The Trijicon 1-8×28 is the first premium 1-8 scope to be released without an absurd price tag. While out of the range of most at a street price of around $1400, you need to keep in mind this scope compares to others in the $2-$3k range. Also, this model is made in the USA. The Trijicon 1-8 sports an FFP reticle that is very similar to the SWFA 1-6 HD from years past. On 1x the reticle has small illuminated crosshairs with a large illuminated donut around the outside. This allows for lightning quick target acquisition that can rival that of a red dot. When zoomed in the cross hair and mil marks become more pronounced making precision work a real treat. This model comes with either mil or moa exposed turrets with a reticle to match. Another bonus is the tool-less zero and zero stop. Just unscrew the top cap, pull up the turret, turn to zero and slide back down. Replace the cap and you are good to go. Glass quality is what you can expect from Trijicon. Amazing optics with a true 1x and extremely detailed 8x. When compared to the Bushnell 1-8.5 and US Optics 1-8, the Trijicon comes in at a feather weight 25oz. This may sound heavy but when comparing to other premium 1-8 scopes this is up to 5oz’s lighter! The Trijicon 1-8×28 is just as at home on an ar15 or a short barreled bolt gun. If you want the best high end 1-8 scope for your money look no further than the Trijicon 1-8×28. It was a close call between the Primary Arms Platinum 1-8×24 FFP and the Trijicon 1-8. Honestly, you could just about flip a coin and come out ahead. Both of these optics are fantastic values even when comparing to much more expensive models. Also, do not make the mistake in thinking this is just a simple upgrade from it’s non-Platinum brother. This scope is 100% different and at a completely different level. While the Trijicon is made in the USA, the Primary Arms Platinum series scopes are mostly made in the same Japanese factory that Nightforce and other brands use for their high end models. The QC coming out of that factory is right up there with the best in the industry and these Primary Arms Platinum scopes are no different. Glass quality is right up there with the best. 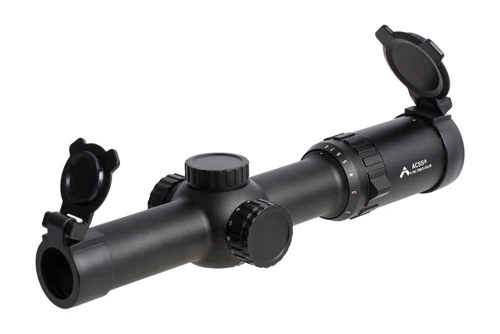 Awesome eye-box and a true 1x are expected at this price range and the Primary Arms certainly delivers on all fronts. The ACSS reticle is beloved by many and makes holdovers extremely easy. Also note, while the reticle is geared for 223 and 308 respectively it is still possible to run this reticle with whatever caliber you want. You can’t go wrong with the Trijicon or the Primary Arms Platinum 1-8×24 at this price point. 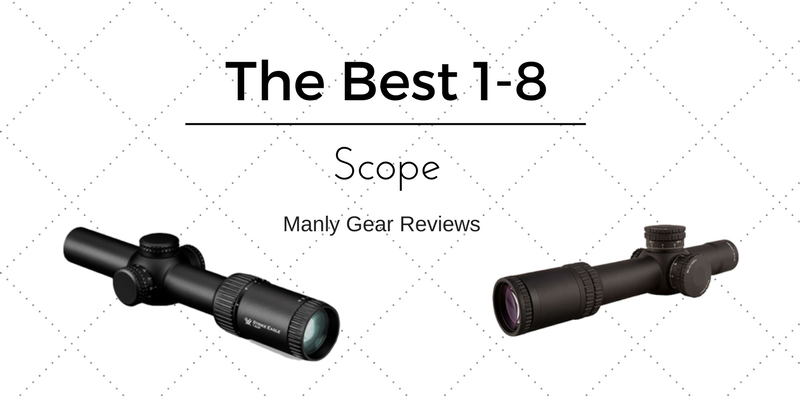 Both are superb scopes and are truly some of the best 1-8 scopes you can get at any price point.